Surely one of the biggest PR challenges in Western history has been making the case that the Bible is The Good Book. Of course, the church had a free pass for a long time; it could get away with claiming the Bible as ‘word of God’ for the many centuries during which the laity had no access to scripture. The faithful could see scripture depicted on the ceilings and walls of the great churches and cathedrals: much larger-than-life, idealized portrayals of Bible heroes. It’s easy to get away with myth—and disguise the mistakes—when you’ve mastered awesome production values. Even after Martin Luther had shifted authority from the papacy to the Bible—and it was finally translated into the vernacular—there was little capacity or inclination to read the Bible critically. It was holy writ, a relic to be venerated, and apologists could be trusted to find the ‘spiritual truth’ lurking behind the most hideous parts of the canon. But the reckoning finally came. Eventually it occurred to serious thinkers that the Bible should not be exempt from critical scrutiny. For the better part of two centuries scholars have debated and studied every verse of the Bible, and, truly, its status as ‘word of God’ has been wiped out. Even many devout scholars did not let their piety stand in the way of honest analysis of the sacred documents. Well, for the most part, but it has been an uphill battle rescuing enough of the Bible to make it worthwhile. Being under no constraint of piety, however, secular thinkers are dumbfounded that the Bible remains an object of veneration. Fatal Flaw #2 in the ‘word of God’ argument—come on, Bible believers, fess up—is that far too much of the Bible is pretty bad. Even the many negatives about Jesus are on full view in the gospels; how in the world can Christians ‘love their Jesus’? If God inspired the Bible he deserves a failing grade. My article on Fatal Flaw #1 can be seen here; the Introductory article is here. • Isaac Asimov: "Properly read, the Bible is the most potent force for atheism ever conceived." • Valerie Tarico: Why Is the Bible So Badly Written? Religion was invented because humans craved a way to get right with the gods, and priests claimed to be specialists: They knew the rules and rituals that worked. But the ultimate connection to the gods—most highly sought after—was an eternity of bliss in their presence. Why not sell that? The author of John’s gospel was fully on board and saw Christianity as a private cult. He created this gem of magical thinking, one of the most disturbing texts in the New Testament…why don’t Christians wretch? The dishonesty of the eternal life gimmick is not hard to grasp. 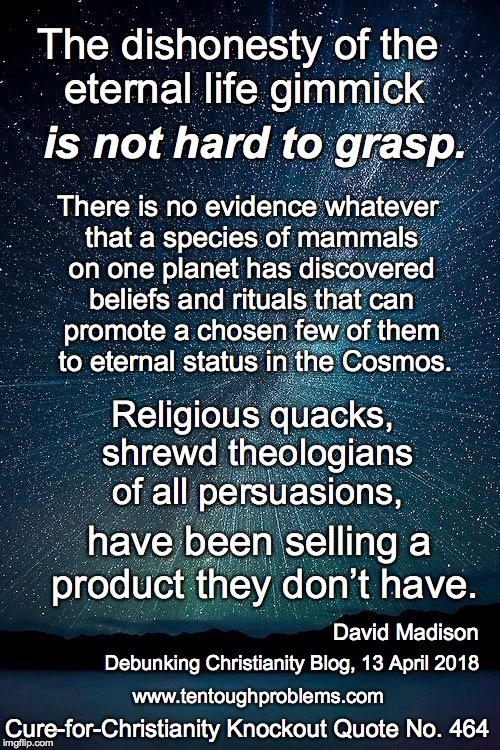 There is no evidence whatever that a species of mammals on one planet has discovered beliefs and rituals that can promote a chosen few of them to eternal status in the Cosmos. 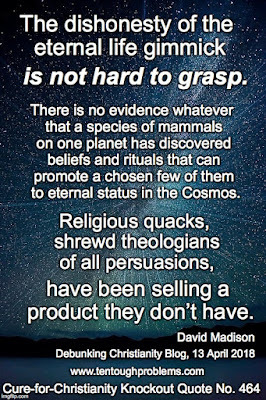 Religious quacks, shrewd theologians of all persuasions, have been selling a product they don’t have. The very concept is absurd—especially those versions that include dead relatives waiting for loved ones to show up.